Corporate vice president of Research and Development, The Dow Chemical Co.
A.N. 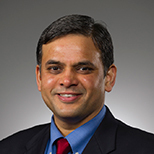 Sreeram is corporate vice president of research and development for Dow, where he focuses on accelerating development and commercialization of new products that solve global challenges while also saving energy, reducing greenhouse gas emissions and conserving water. Recent innovations include SILVADUR™ Antimicrobial technology for fabrics, EVOQUE™ pre-composite polymer for paints and the low-energy FILMTEC™ ECO Reverse Osmosis Elements for water purification. OPINION: Looking for the secret to true sustainability? Here you go.